Same camera, same ISO value. And would you believe the second image is underexposed by two stops more than the top one? No way, you say. Way, I say. You Nikon 1 users are going to love this technique, believe me. At least for static subjects. Let's start with what I'm doing here. The two examples are both shot on a Nikon V2 at the base ISO of 160. I've deliberately not lit my studio scene so that it triggers not only a one stop underexposure on the first example, but plenty of noise in the shadow areas. You all see the noise in the top image, right? This is equivalent to what you get in the deep shadows with the V2 in normal use, and is typical of small sensor cameras. We're going to fix that once and for all, at least for landscape work. So what's different about the second shot? Simple: it's 40 shots combined into one. Since I'm working on a tripod (as I usually do with landscape photography), it's easy enough to just take more shots. The reason they are two stops more underexposed is because there's so little light in my studio for this shot that I can't set a slow enough shutter speed in a fast burst. But despite the underexposure and despite the small sensor, that second image is stunningly free of visible noise and very high on real detail. Why is that? Because I'm using a software technique to use multiple shots to reduce noise. We'll get to that technique in a moment, but first we need to talk about why I did this with a Nikon V2. Simple answer: it's easy. Real easy (as it is on all the Nikon 1 cameras). Make all your settings manually (no autofocus, no auto white balance, and so on). Select a shutter speed that's at least 1/60. In the Shooting menu pick a Continuous frame rate of 30 fps (or 5, 15, or 60; the more images you use, the better the noise reduction, but the longer the post processing will take you). Press the left edge of the Direction pad and make sure you're on continuous shooting, not single shot. Hold down the shutter release to get about a second's worth of images (40 in the sample shown). 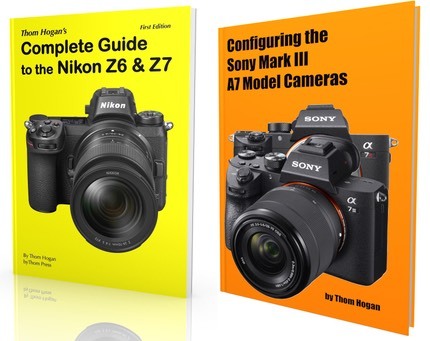 With other mirrorless cameras, you'll have to figure out how you're going to do the continuous sequence yourself. The Nikon 1 cameras are particularly well suited to this technique because they can shoot and buffer the full set of images you take (5, 15, 30, or 60) in one second. Okay, the card will write for awhile longer than one second, but you won't be bothered by small buffers like you are on some cameras. It's easy to grab a bunch of shots in a very short time. We want a short time because clouds move, leaves blow in the breeze, and even silly things like a bee popping into the scene can have you headed for the clone tool really fast. I generally leave my camera in Manual exposure mode and set up to do this, but in the fourth bullet point, above, switch out to Single frame for my normal shooting. Thus, I'm often ready to go with only a two-step process on the V2 (switch from Single frame to Continuous, turn off autofocus). Okay, we've got our images and we've ingested them over to our computer, what should we do to post process them? First, we're going to select those images in Adobe Bridge. Next, I'm going to right-click on them and select Stack/Group as Stack (you can also select Group as Stack from the Stack menu or use the shortcut of Command-G [Mac]). Next, we're going to open the stack of images in Adobe Raw. Right-click the stack and select Open in Camera Raw, or select Open in Camera Raw from the File menu, or use the shortcut of Command-R (Mac). Click the Select All button at the top left so that we're working on all the images together. Then apply whatever usual raw processing changes you need to (exposure, white balance, etc.). However, I'd suggest leaving off any sharpening or noise reduction controls; just zero them out at this step so that they don't get in the way of what we're trying to do. When you've made your raw conversion selections, click the Done button. Next, from the Tools menu select Dr. Brown's Services and from the sub-menu Dr. Brown's Stack-a-Matic. If you're a Photoshop Extended user and haven't seen what those scripts can do, I suggest that you head on over to the evil lair…uh, I mean Web site, and take a gander at the videos. No doubt the videos alone will inspire you to download the scripts and install them (instructions are in the download, and involve Adobe Extension Manager, another thing you probably should know more about if you want to be a pixel pusher). Okay, so you've got the scripts loaded, let's return to our little task. Select Dr. Brown's Services in the Tools menu and from that select Dr. Brown's Stack-a-Matic. We're now presented with a dialog. I'm trying to keep this article short and to the point, so I'm not going to point out all the wonderful things that you can do with just this one script. 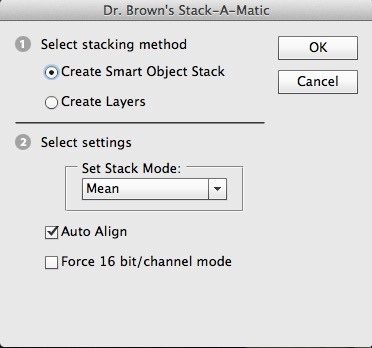 Instead, I'm going to cut to the chase: select Create Smart Object Stack, a Stack Mode of Mean, and Auto Align. Technically, there are other things we can select than Mean, but I've selected it as everyone should immediately grok what we're doing here: we're asking the script to average the pixels of all the images. If the noise in the underlying images is anything close to random, that should improve things dramatically. And as you've seen, indeed it does. Depending upon how big the images are and how many of them you have, it might take Photoshop a while to get them all layered up, aligned, and all the pixel calculations done. In fact, I can guarantee that it'll take far longer than it took Nikon 1 users to generate the images in the first place, even on a wicked fast computer like a tricked out MacPro. But the end justifies the mean (pardon the pun), and I'm willing to wait a bit for exceptional images to process. So what do you do with this knowledge? Same thing I've been doing: when you're out shooting static landscapes with a small sensor camera, generate a quick set of images. The Nikon 1 is great for this because even clouds tend to stay put in the short amount of time the camera rattles off all the images. Moreover, it's small sensor could use some help in the deep shadows. I'm getting very clean landscapes with very good detail from the V2 since I started using this technique. Aside: stacking images with moving objects, like a river or a waterfall tends to work pretty much like using a long exposure: the movement will be smoothed out. How smoothed out depends upon how many images and how long the sequence took to take. But this is a way of avoiding using small diffraction impacted apertures or a neutral density filter to bring down the exposure. Technically, each doubling of frames nets you a half stop dynamic range increase. Two frames the DR goes up 0.5EV. 4 frames and you’ve gained 1EV. With my 40 frame stack, I’ve gained somewhere between 2.5 and 3EV of dynamic range. Remember, these were severely underexposed images I used here. And again, since some people are confused about why I'm using underexposed images: I'm trying to simulate the deep shadows at base ISO in a way that will clearly show up in compressed JPEGs on the Internet. The underexposure isn't part of the technique at play here. Usually you want to expose normally. Note, Dr. Brown's Services requires Photoshop Extended. If you only have Photoshop and want to stack images to create a quasi-mean value, read this article for one way to get a similar effect. If you do have Photoshop Extended and don't want to use Dr. Brown's scripts, select Load Files into Photoshop layers from the Bridge Tools/Photoshop menu. Select all the layers, then use Convert to Smart Object from the Layer/Smart Objects menu. Then select Stack Mode/Mean from that same menu. A question that came up was been whether or not the Stacked Mean method in Photoshop Extended is better than Long Exposure Noise Reduction (LENR) used in camera. They’re two different tools that do different things and treat different types of noise. But for what we’re trying to do here (increase DR), yes, Stacked Mean is the clear choice. But wait, there's more than just noise reduction possible. Order now and you'll get HDR…wait, no, that's a later technique. You need to master this one first before I can show you how to pull the next bit off.